Despite having its own courts since 1840, New Zealand’s judicial system didn’t become entirely independent until 2003, when the Supreme Court replaced the British Privy Council as New Zealand’s court of final appeal. The judicial system is made up of courts, some of which have more power than others. Courts resolve conflicts between people, or between people and the state. Court judges base their rulings on written law (legislation) and common law – law that developed from previous judges’ decisions. New Zealand’s first courts were established in 1840. The Supreme Court, which is what the High Court was known as until 1980, was founded in 1841. There were various lower courts, including magistrates’ courts, which continued until 1980, when they were renamed ‘district courts’ and given wider responsibility. The Supreme Court is the highest court in New Zealand. It is an appeal court, which means that it rules on cases that have been first heard in a lower court. 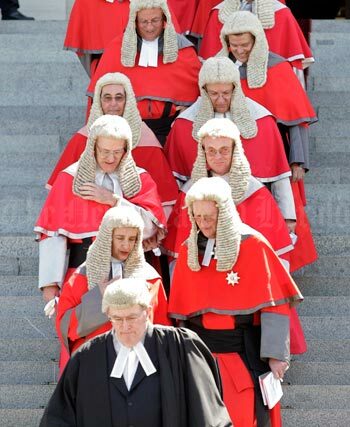 Before the Supreme Court was founded in 2003, the Privy Council, a court in London, was New Zealand’s court of final appeal. In the Supreme Court usually five judges will hear each case, and the chief justice presides (leads). Other lower courts have to follow the Supreme Court’s decisions. The Court of Appeal is also an appeal court. Between three and five judges sit on each case, depending on its public importance. Court judges are appointed by the governor-general, on advice from specific government ministers. For the judicial system to be fair, it is important for judges to be independent from political interference. To ensure this, they have ‘security of tenure’, which means they can only be removed from their jobs for misconduct, and their pay cannot be reduced.